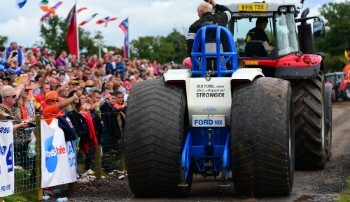 Tractor pulling competitions take place on a 100 metre track, and involve the machines pulling a weight transfer sledge. A weight transfer sledge basically gets heavier to pull as it is pulled down the track. This is achieved by increasing the weight on the pan of the sledge by moving the weight box from the rear to the front of the sledge as the sledge is pulled forward. The winner of the competition is the machine that can pull the sledge the furthest. If more than one competitor completes the 100 metre track with the sledge (a full pull), then the sledge is made harder to pull, and the competitors who made a full pull go again until they are stopped and a winner obtained. Tractor pulling is called “The World’s Most Powerful Motor Sport” with some machines producing in excess of 9000 horsepower. However, the sport has many varied classes ranging from the small, single engined 950kg Modifieds, through the stock machines to the multi-engined 4.5 tonne machines. Here is a brief description of the classes which are competed at events with the North West Tractor Pulling Club. The weight of each class is the weight of the machine and driver ready to compete. The Super Farm class is based on a stock farm tractor and is limited to one turbo charger and a RPM limit of 2800. The original tractor engine must be used. This is a low cost class and a starting class for many tractor pulling competitors. The class is competed at 3.5 tonnes. The Under 401 Prostock class is again based on a farm tractor using the original engine; it’s limited to one turbo charger and a engine size of 401 cubic inches (6.57 litres). There is no RPM limit on this class, which for many is the next step up from Super Farm in the world of tractor pulling. The Under 401 Prostock class is competed at 3.5 tonnes. The Prostock class is the next level of stock machines used in tractor pulling. This class is again limited to one turbo charger, but with a larger limit to the engine size of 510 cubic inches (8.36 litres), and again must use the original engine block and cylinder head. These machines become much more highly tuned than the previous classes and again compete at 3.5 tonnes. The Superstock class is the most highly tuned of the tractor pulling stock classes. Based on a stock tractor, the machines can use up to 3 turbo pressure stages. As long as the original engine block is used, they can be tuned to almost any level, most these days not using the tractor’s original fuel of diesel but choosing to run on methanol to achieve more power. The Superstock class again competes at 3.5 tonnes. 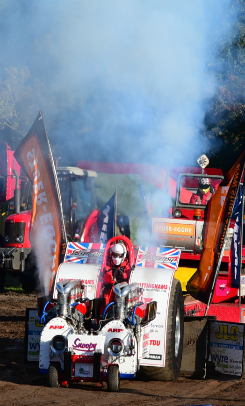 The smallest of the modified classes, and formally called the Mini Modified class, this tractor pulling class is a single engine machine weighing in at just 950kg complete with driver. The engines used in the 950kg Modified class range from supercharged V8’s to turbine engines and even V12 aircraft engines. This is the class where almost anything goes – in the Modified class, you’ll see any combination of engines, gearboxes and rear axles imaginable. This class is competed at 2.5, 3.5 and 4.5 tonnes. ETPC limitations are set to limit which engine combinations can be used to obtain a fair horsepower limit for each weight class. The 4.5 tonne class is the most powerful in the tractor pulling world, seeing engine combinations like 5 V8s, 3 V12 aircraft engines or 4 turbines. Horsepowers over 9000 are not uncommon. The BTPA also has a Limited Modified class, this is a 3.5 tonne class with lower horsepower limits than the normal 3.5 class so as to provide a lower cost entry class into the Modified division. 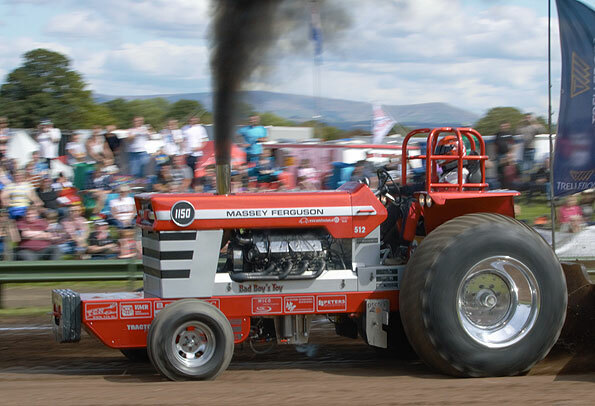 This single V8 engined tractor pulling class is basically a modified class with a dragster/funny car type body fitted. The engine size of this class is limited depending on the type of cylinder heads fitted. This provides a class where the competition is very close. The Two Wheel Drive class is competed at 2600 kg. This class is basically a road-going twin-axle truck with safety modifications for tractor pulling. The amount of tuning allowed has been kept low to provide an entry level class into tractor pulling. The class is competed at 8.5 tonnes.